Lynne Avadenka: "I investigate the philosophical and physical presence of the book: the very nature of visual language, the visual power of word and image combined and the notion that both are codes to be deciphered." Huntington Woods, Michigan: Land Marks Press, 2013. Edition of 18. 8.5 x 24 x 1.75". 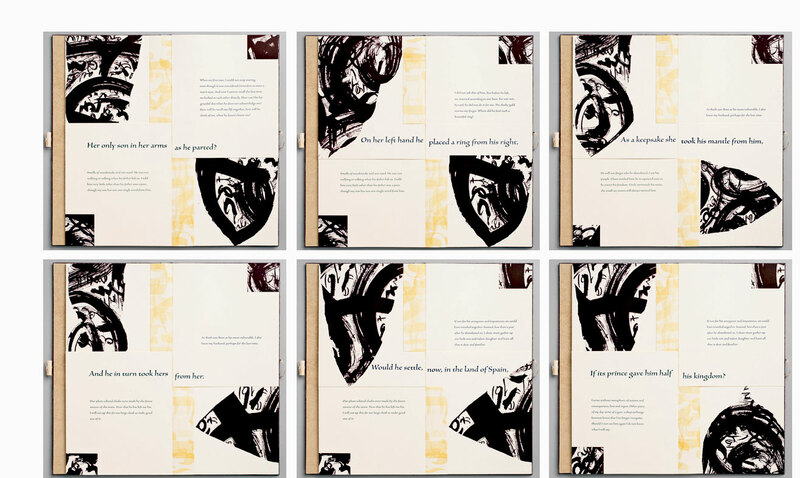 67 prints (7.5 x 7.5" each) are housed in portfolio boxes designed in collaboration with Linda Lembke of Green River Bindery. 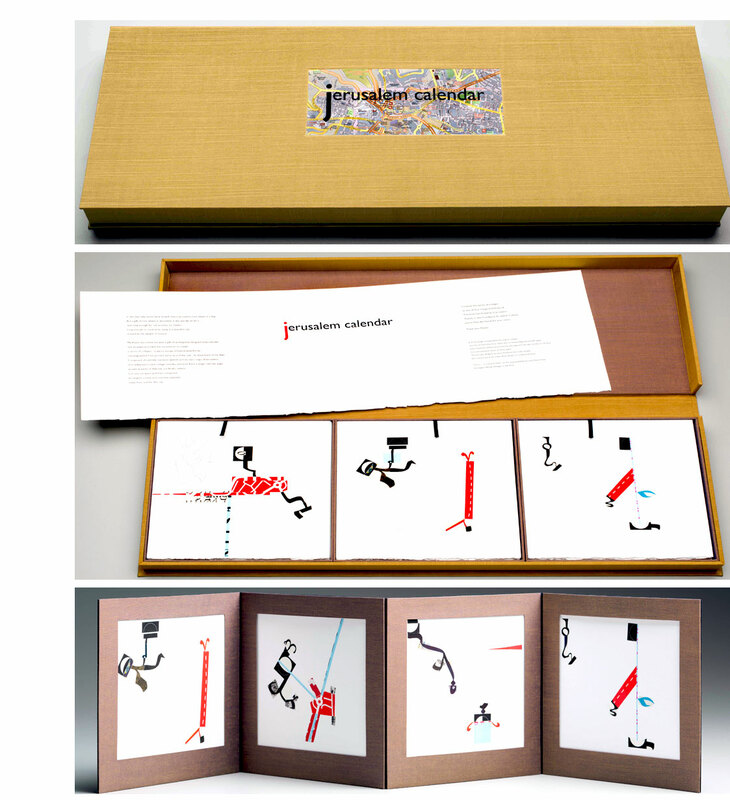 Each box includes three trays to hold the prints, and each tray is lined with a letterpress printed page that displays the month (October, November, December) in which the collages were created. Tucked under the tray that holds the October prints is an accordion fold frame for viewing any four prints from the suite. 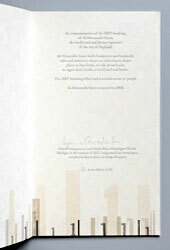 Each portfolio box is covered in silk book cloth, and includes a title label letterpress printed on a map of the city. The original collages were photographed and then printed with archival inks on Moab Entrada acid free rag paper by R.H. Hensleigh. Avadenka letterpress printed a title page/essay/colophon about the project on BFK Rives paper. Composed of calendar contents (Jewish and secular), maps of Jerusalem, and newspapers, each collage includes elements from a single calendar page, as well as parts of Hebrew and Arabic letters. 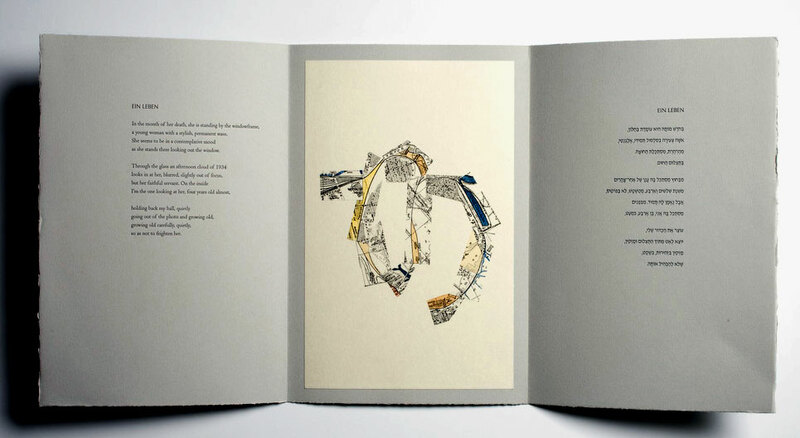 Cut out, cut apart and then composed, they suggest a lively and inventive alphabet, from and for the city. Land Marks Press: "In 2011 I spent two months in Jerusalem, one of four inaugural Fellows of the American Academy in Jerusalem. While there I created 67 collages, one for each day of the fellowship. 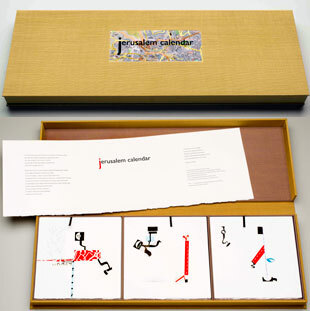 Upon returning home I created a limited edition project based on this work: Jerusalem Calendar." 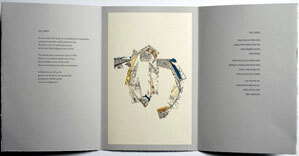 Lynne Avadenka's Jerusalem Calendar by David Stromberg, The Arty Semite: "Detroit-based printmaker and book artist Lynne Avadenka, whose previous projects have dealt with Hebrew and Arabic typography, exhibited recent works this week at the Jerusalem Print Workshop in the city’s Musrara neighborhood. The works are a culmination of her fellowship at the American Academy in Jerusalem. 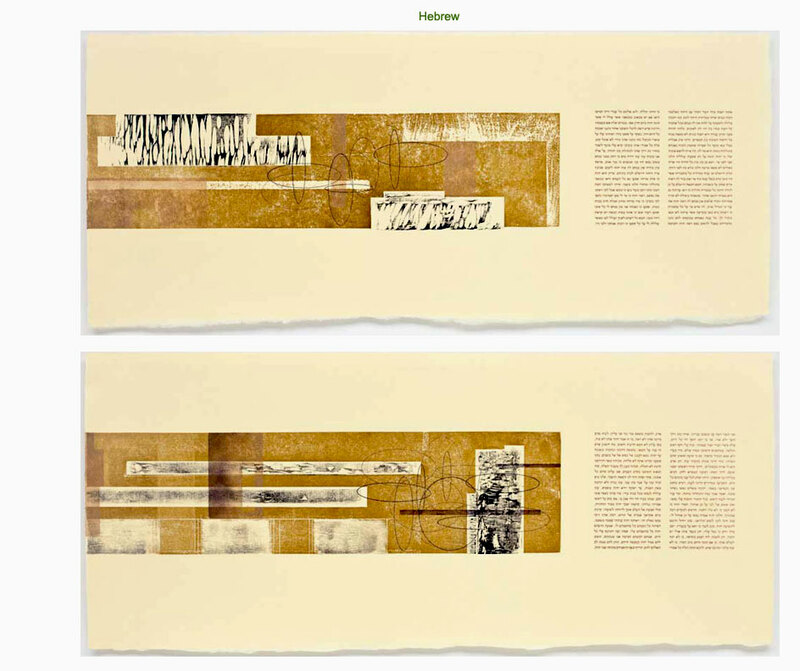 "Having arrived in Israel, Avadenka found herself making monotypes, using a printing technique in which the artist draws on a metal plate and uses a printing press to transfer that image onto paper. At a used bookstore, she found an old Arabic algebra book. After some research she discovered the word algebra originated from the Arabic al-jabr, or 'the reunion of broken parts,' and began to cut out some of the terms to incorporate them into her prints. "'I also used plates I found around the workshop with images already on them,' explains Avadenka,' and I started adding or scraping away from these' — an action that, for her, stood for the idea of Jerusalem made of many layers. "At the same time, Avadenka began a side project on which she worked in a makeshift studio at her apartment. These consisted of intimate collages made out of local ephemera — Hebrew and Arabic calendars, flyers, newspapers — in a black, white, and red palate, with the occasional blue thrown in. "The collages recall the work Soviet-era constructivists whose style Avadenka admires. The result is abstract and sophisticated — the work of a mature artist who knows how to create tasteful forms out of raw material while still giving it a stylistic flourish. "For Avadenka, these works are mainly a kind of record-keeping while being in a particular place. They only make sense for being here. Maybe, if there are enough discrete symbols here, I’ll extract and create a new alphabet — and with that a new series.'" Huntington Woods, Michigan: Land Marks Press, 2011. Edition of 20. 4.75 x 6.75 x 1.5"; 12 puzzle pieces. Gill Sans and Schoolhouse types printed letterpress from photopolymer plates, combined with pochoir on waranshi paper. Pages are backed with Michigan maple veneer. Housed in box with pull out drawer. Paper title label tipped on box. Colophon tipped in bottom of drawer. Signed by Avadenka and Campbell. Campbell's story of love and addiction is embodied by the skill and vision of a talented book artist. 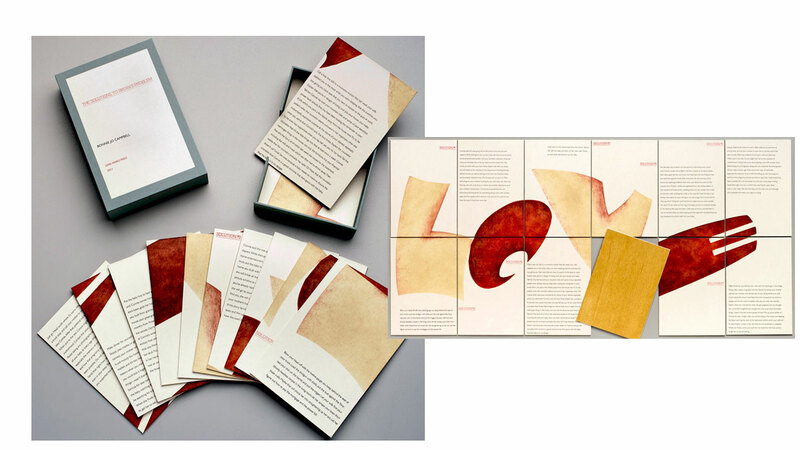 "Designed as a puzzle to be solved, Avadenka's edition combines a skillful integration of text and image with an innovative format." Colophon: "The pieces of this puzzle fit together for you to read the story and to see perhaps the only, unavoidable solution." Bonnie Jo Campbell was a finalist in the 2009 National Book Award in Fiction. Her collection Women and Other Animals won the AWP prize for short fiction. She resides outside of Kalamazoo Michigan and teaches at Pacific University. Huntington Woods, Michigan: Land Marks Press, 2010. 12 x 6";28 pages. Simple accordion flag structure with double flag pages interspersed. Letterpress printed on Shin Torinoko Cream paper from photopolymer plates. Printed with Silentium Pro and David types and Hebrew wood type. Illustrations of color lithography created from brush drawings. 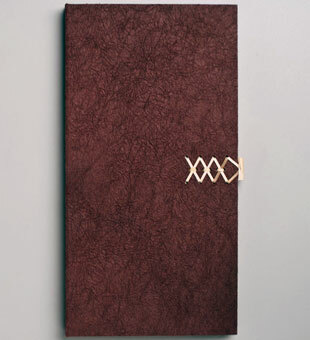 Housed in a wrapper of Kyosei-shi paper over boards with a laced vellum closure. 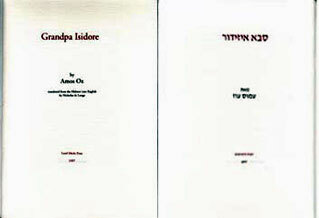 Text printed in Hebrew and English. Land Marks Press: "Of the hundreds of Hebrew poems written in medieval Jewish Spain, one is attributed to a woman. Will Her Love Remember, by The Wife of Dunash ben Labrat, is the starting point for Lynne Avadenka’s new artist’s book, Plum Colored Regret. The original poem drives the movement of the book and Avadenka’s powerful prose amplifies the voice of the poet. 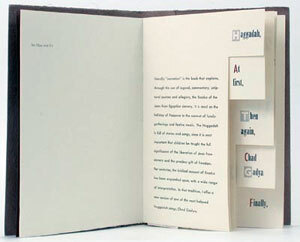 "Plum Colored Regret, like other editions created by Avadenka, combines a skillful integration of text and image, an original, innovative binding and multiple printmaking techniques. The tiles and calligraphic art of medieval Spain inspire the format of the book and the imagery contained within." The innovative structure of overlapping pages gracefully and delicately allows the book to present an 8-line poem from 10th-century Spain, Peter Cole's contemporary English translation of the poem, and Avadenka's own words, her response to that poem, "opening it up to fill its elegant blanks." Part visual music that echoes and expands the original poem and part a physical demonstration of the unstated poem's depth, Plum Colored Regret continues the long line of impressive works by Land Marks Press. And to think this one began with a woman known only as "The Wife of Dunash ben Labrat." Huntington Woods, Michigan: Land Marks Press, 2009. 13 x 29.25 x 1.25"; 12 unnumbered leaves. Sheet size is 12" high x 28" wide. Created with woodcuts, photopolymer plate printing, and stencils. Letterpress printed with Centaur and Koren types on Yamada Hanga cream paper. Housed in a cloth-covered oblong clamshell box, which has a woodblock inset on its top. The text, from the biblical book of Lamentations, is printed in Hebrew and English. The English translation is from the Jewish Publication Society. 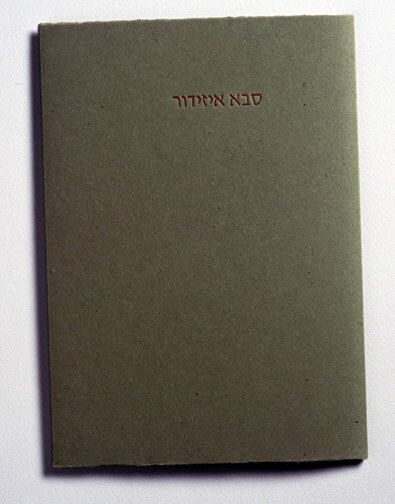 Each text page (5 in Hebrew, 5 in English) is accompanied by a color woodcut. The custom-made box includes an inset carved piece of wood from which prints were made. 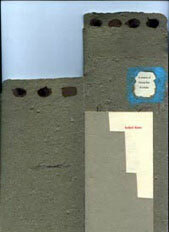 Colophon: "Echoes, reverberations, multiplicities, repeats: the long narrow sheet - a scroll unrolled - like the original Book of Lamentations; prints from wood, the same material from which houses are built, with traces of home cut out: doors, windows, openings; orbits linked and overlapped, inked and overprinted, suggesting absence, presence, and interconnected lives." Lynne Avadenka, essay: "The language of the lament envelops us with no less immediacy, and the keening that began in 586 BCE is clearly audible 2500 years later. The Book of Lamentations is powerfully graphic in its recounting of disaster and despair, a chronicle of losses after the siege and sacking of Jerusalem by the Babylonians. Five short chapters capture in astonishing vividness the complete obliteration of an entire city and the subsequent exile of all its former inhabitants. As the voice of the narrator shifts from mother to man to nation, an abecedarium of atrocities and zealous decimation is laid bare. For most of the Book of Lamentations, the format is an alphabetic acrostic, perhaps meant to highlight the skill of the author, perhaps meant as an aid to those who memorized the text, or perhaps meant to illustrate the inexhaustible list of damages suffered by the people. It is thought, because of the intensity of the descriptions in the Book of Lamentations, that it was written shortly after the destruction occurred, and some believe the author was the prophet Jeremiah. Authorship is not nearly as important as the text itself, sober and clear-eyed in its documentation of the unspeakable. The Book of Lamentations is recited each year in late summer, in accordance with its Hebrew date, the 9th of Av. In fact, it is not read, but sung, in a particular minor tune, echoing and evoking the tragedy of the text. We sit on the floor as the text is sung; we mourn destruction, and mourners sit low. In Lamentations, we hear the voices of the powerless, the ones overwhelmed and overrun by those in control. What perplexes the people is that they are given no reason for this calamity. They wonder: what was our sin, what did we do wrong, why do we deserve this? And the text offers no answers to these difficult questions. Lamentations is at once specific, and, unfortunately, universal. A story from antiquity and of modern times. A city, once full of people, is destroyed and emptied, putting into motion a cycle of exile, displacement and disruption. If home is not a physical place, it is family. If a family is destroyed, where is home? And who will gather all the exiles, who will remember them, renew them, take them back, as in days of old, as before?" Huntington Woods, Michigan: Land Marks Press, 2007. 7.75 x 11.5 x 1"; 8 tri-fold sheets. Lithographs printed on waran-shi paper and then hand colored with gouache. Types: Centaur, David, and Optima. Printed letterpress from photopolymer plates on Magnani grey paper. Laid into letter-fold cloth-covered portfolio. Text in English and Hebrew. Colophon: "In the fall of 2006, Lynne Avadenka was an artist in residence at the Oberpfalzer Kunstlerhaus in Schwandorf, Germany. While there, she created a series of collages, from maps included in a 1910 Baedeker guide to southern Germany. These collages are composed of train lines, symbols of modern efficiency and wartime inevitability." Gabriel Sanders, The Jewish Daily Forward, December 4, 2007: "In the fall of 2006, Michigan-based artist Lynne Avadenka went to the Bavarian town of Schwandorf for a six-week artists’ residency program. Never having been to Germany, she picked up a couple of books she thought might be useful in helping her prepare: a Baedeker guide to southern Germany, some secondhand German-English dictionaries, and a Hebrew German grammar she had found on a discard table at her local Jewish library. Little did she know how centrally the books would come to figure in the work she was about to undertake. 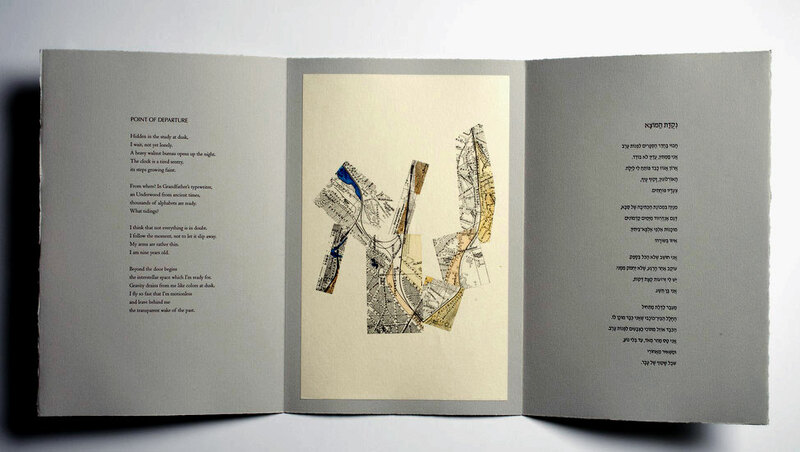 "Alongside these figures, Avadenka placed bilingual versions of the work of Israeli poet and concentration camp survivor Dan Pagis (1930-1986). 'The stark, allusive forms seemed a good counterpoint to Pagis’s stark and allusive poetry,' said Avadenka." Introduction: "The remarkable life of Dan Pagis began in Radatzch, Bukovina in 1930; he died in Jerusalem in 1986. During World War II, when he was in his early teens, Pagis was imprisoned in a concentration camp in the Ukraine. He escaped in 1944, and two years later made his way to a kibbutz in pre-state Israel, where he later became a teacher. Pagis received a PhD at the Hebrew University of Jerusalem, and taught medieval Hebrew literature there, becoming an expert in the field. Through his powerfully lean and direct poetry, Dan Pagis is one of the writers and visionaries who shaped the modern, living Hebrew language." Huntington Woods, Michigan: Land Marks Press, 2006. 8 x 8" page size. 8 x 2.75" tab page. Double sided accordion, 11 panels. Laid in a letter-fold paper wrapper. Printed offset in full color and die-cut on 80# dulcet cover. Legend and Centaur types used on the text pages. 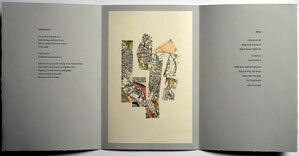 Image pages created from original drawings that combine gouache, powdered graphite and letterpress printing. 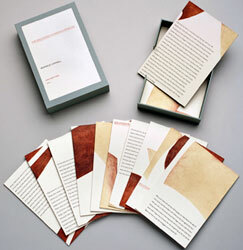 Produced at the Borowsky Center for Publication Arts, at The University of the Arts in Philadelphia, Pennsylvania. Land Marks Press: "Imagine a conversation between two extraordinary women, separated by a thousand years, yet connected by acts of bravery and more than coincidental commonalities. Imagine that this dialogue transcends time, and links Queen Esther, from the Jewish story of Purim, and Scheherazade, the Muslim woman who told stories for a thousand and one nights. This is the inspiration for Lynne Avadenka's new artist's book. 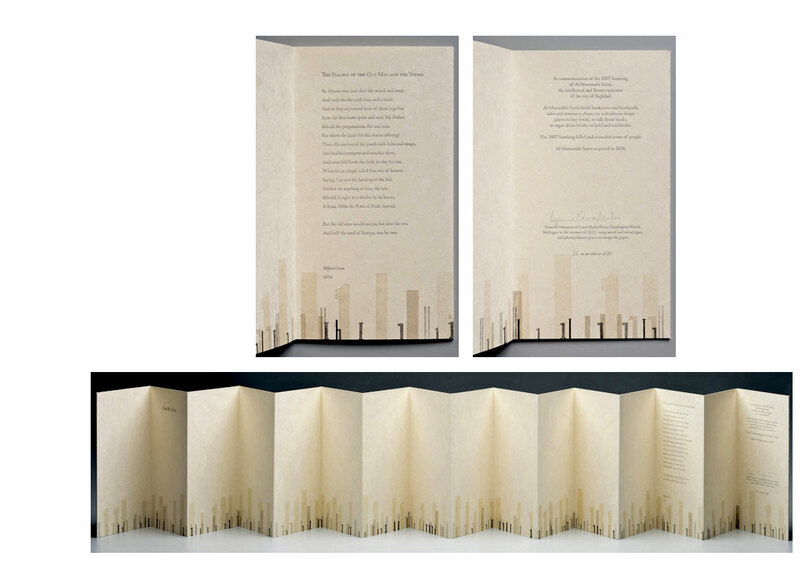 "The book structure reinforces the never-ending, always mutable nature of storytelling, and the narrative is printed on tabbed pages that weave their way through the evocative imagery printed on the accompanying page spreads." A review by Nick Sousanis "Language Will Save Us:" Lynne Avadenka's "By A Thread" and the Power of Words." Huntington Woods, Michigan: Land Marks Press, 2003. Edition of 150. 10 x 5"; 4 leaves. Letterpress printed. Pamphlet stitched binding. In maroon flap-fold wrappers with grey and black printed illustration. Signed and numbered by the artist on the colophon. An essay by Vince Carducci about art in the 21st century that reflects on Avadenka's series of unique untitled works on paper created in response to 9/11. The essay first appeared in metrotimes on September 4, 2002. Carducci, Dean of Undergraduate Studies at the College for Creative Studies in Detroit, ends his essay with: "It's worth noting that Avadenka's series in response to Sept. 11 is untitled for no other reason than that she just can't find words to adequately express (which is to say find a way to put a limit on) what is intended by it, even as she continues to labor at its production and to believe that there is a compelling reason for her to keep doing so. This 'something that cannot be expressed' is also known as the ineffable. It is, ultimately, the subject of all art." Huntington Woods, Michigan: Land Marks Press, 1999. 8.75 x 12” Handsomely printed from polymer plates in Garamond and David types on Frankfurt paper. A full-spread etching, printed in black, green and gold, suggests two windows, two vantage points, and is the centerpiece for the mirrored texts. Handsewn. Twinrocker Sagebrush cover. Signed. Translated from the Hebrew by Nicholas de Lange. Etching by Lynne Avadenka. Text, title, and colophon are printed from front to back in English and back to front in Hebrew. In this short reverie, we enter an old man's remembrance of war. Awakened from a dream, his past and present converge as the thunder outside becomes gunfire, and he thinks he is again the representative of the Jewish community he once was. But, fully awake in rainy Jerusalem, as "the nations rage" on, old confrontations continue inside the man. Not a story of senility, but a glimpse into how past and present can exist simultaneously, how external battles finished, the soul still wrestles injustice. Beautifully rendered. Huntington Woods, Michigan: Land Marks Press, 1993. 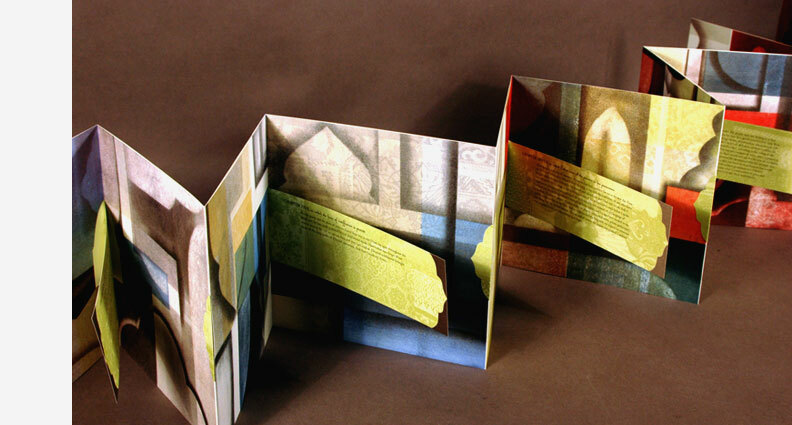 The contents of the book are housed in paper specially made for this edition by Kathryn Clark and designed by Lynne Avadenka during a working weekend at Twinrocker. The paper contains earth from the New Mexican desert, cotton rag, and beaten straw. Protected by a paper case. A biography of Mary Elizabeth Jane Colter, an exceptional woman and a turn-of-the-century architect who designed and built structures throughout the southwestern United States. The largest number of her buildings still standing are found at the Grand Canyon. They represent a visual documentation of her vision, aesthetic concern, and design philosophy. 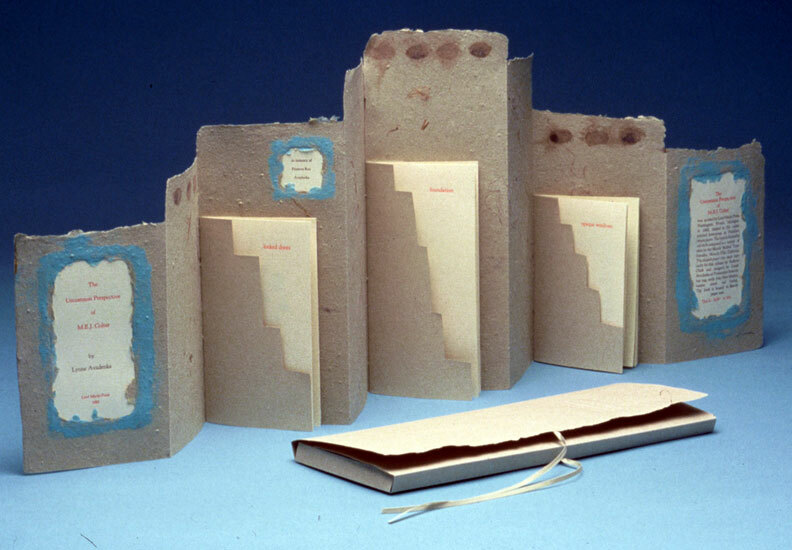 The accordion fold book has three chapters pamphlet-sewn into the folds and is shaped like a Southwestern adobe house. And it feels like adobe!. Huntington Woods, Michigan: Land Marks Press, 2011. One-of-a-kind. 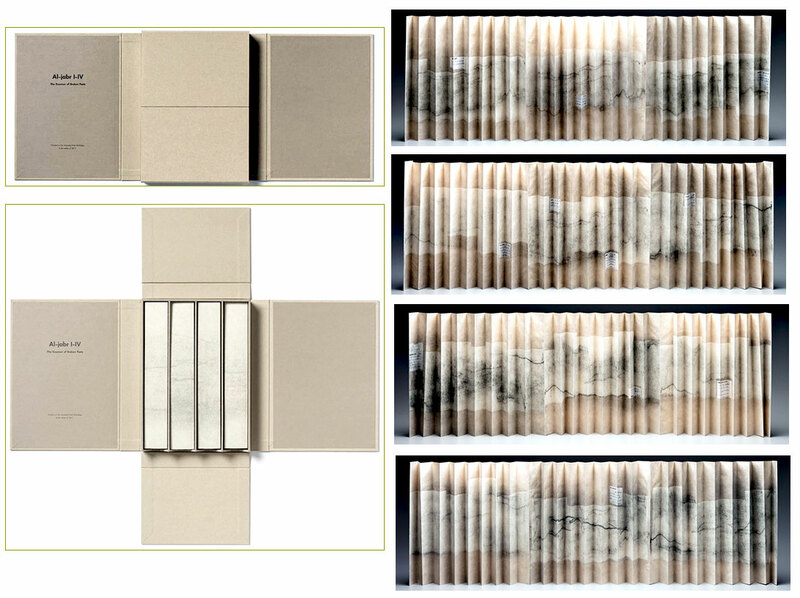 12 x 9 x 1.75" custom box containing four accordion fold books (11 x 60" extended). Intaglio monoprints plus chine collé using papers from Arabic/English math dictionary. Signed by the artist. 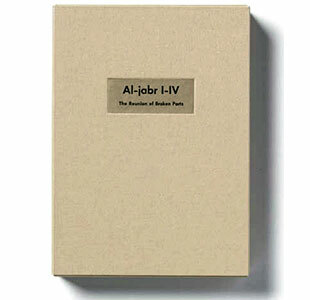 Al-Jabr is a suite of four unique books (Angle/Negative, Reciprocal Equation, Antisymmetric Equation, Sum of an Infinite Series). Lynne Avadenka: "When I was in Jerusalem in 2011 (where I created the Jerusalem Calendar) I was working in a printmaking studio. I did a series of unique prints and several unique artist's books, all incorporating text from a book I found in one of the many used books stores in the city. The book was an Arabic-English dictionary of algebraic terms. The word 'algebra' comes from 'al-jabr' which translates to 'the reunion of broken parts,' a definition with added resonance in Jerusalem." Sarah Rose Sharp, Essay'd: Short essays on Detroit artists, "11 Lynne Avadenka" (February 2, 2015): "The visualization of language is of course a key issue for an artist who deals in typesetting as an elemental force in her work, but not more so than content, Avadenka stresses, and neither more so than the exploration of the marks made available by relief printmaking. Indeed, any given work by Avadenka may fall somewhere slightly different on a Venn diagram designating the intersection of language (content), design, and physical impact. 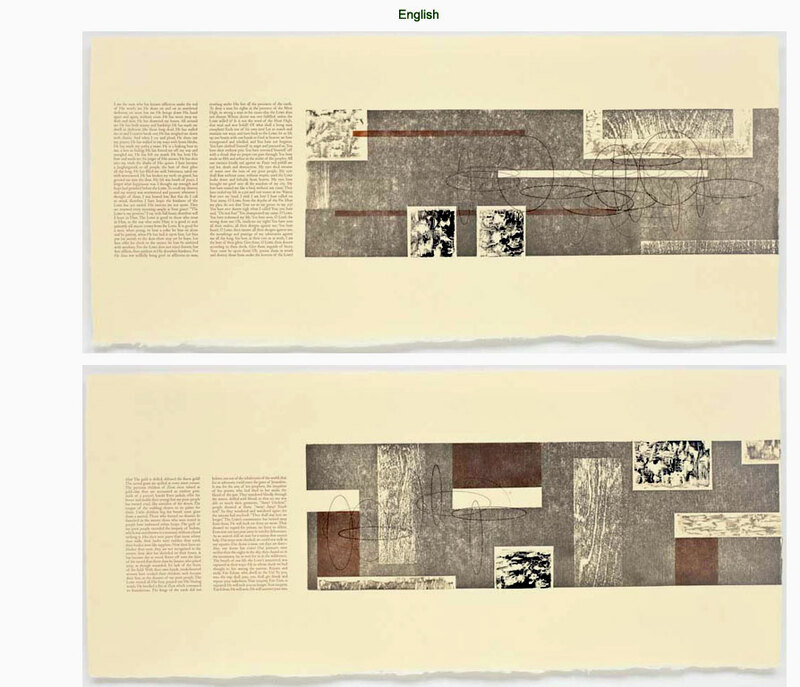 … The Reunion of Broken Parts (2011), a series of monoprints that incorporate chine colle´, found Avadenka dissecting an Arabic text on algebra, juxtaposing definitions of precise mathematical concepts with abstracted backgrounds." 4.75 x 6.75 x 1.5"; 14 pages. Accordion structure. Letterpress printed using wood types, metal types, and photopolymer plates on hanga-shi paper. Paper-covered boards. Signed and numbered. Colophon: "In commemoration of the 2007 bombing of Al-Mutanabbi Street, the intellectual and literary epicenter of the city of Baghdad. “Al-Mutanabbi Street holds bookstores and bookstalls, cafes and stationary shops, tea and tobacco shops: places to buy books, to talk about books, to argue about books, to hold and read books. “The 2007 bombing killed and wounded scores of people. Al-Mutanabbi Street reopened in 2008." Lynne Avadenka: "In thinking about one war, I looked to the poet of another for inspiration. Wilfred Owen’s poem, The Parable of the Old Man and the Young, is no less powerful now than it was when he wrote it in response to World War I, in 1916. "The visual element in One By One is a line of Roman Numeral Ones - all the varieties available to me from my type drawers - marching across the folds of the book. Each 1 is individual, yet connected to the others, and all lead you to the poem and to its last devastating lines." Huntington Woods, Michigan: Land Marks Press, 1990. 6.2 x 9.4" 13 pages. Printed on Frankfurt cream paper. A single signature hand-sewn pamphlet in brown wrappers made of cotton rags, goat hair, and pigment. Title printed in blue, red and gray. 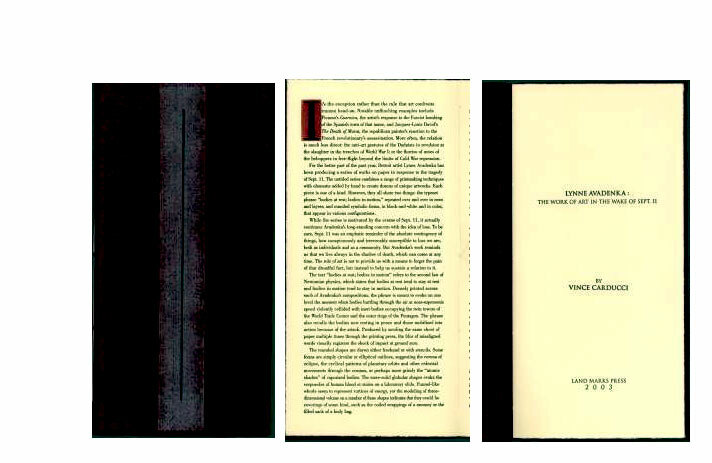 Uses a cut-away stair-step margin printed for page tabs. 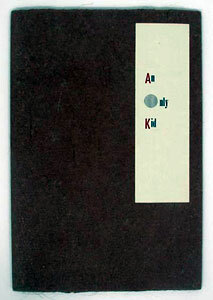 Avandenka says the text and art were inspired by the books of El Lissitzky. From the Library of Congress collection: "An artist, a printmaker, and a calligrapher, Lynne Avadenka created this version of “Had Gadya,” the last and one of the most beloved songs in the Haggadah, the book read on the holiday of Passover in the context of family gatherings and festive meals. “Had gadya” (“an only kid”) are the first two words of the song. Allegorically, the song describes successive nations that seek, one after another, to devour and destroy the Jewish people. Finally, God ends the escalating violent cycle, bringing peace. Avadenka suggests in her commentary that “Had Gadya” might also be a song of personal redemption, where one rises beyond fear and doubt to create a life for oneself, guided by deeds of lovingkindness." Huntington Woods, Michigan: Land Marks Press, 2001. 9.75 x 12”; extends to 77”. Letterpress on Gampi Torinoko and Hanga-shi papers. The selected words were hand lettered then transferred to photopolymer plates. 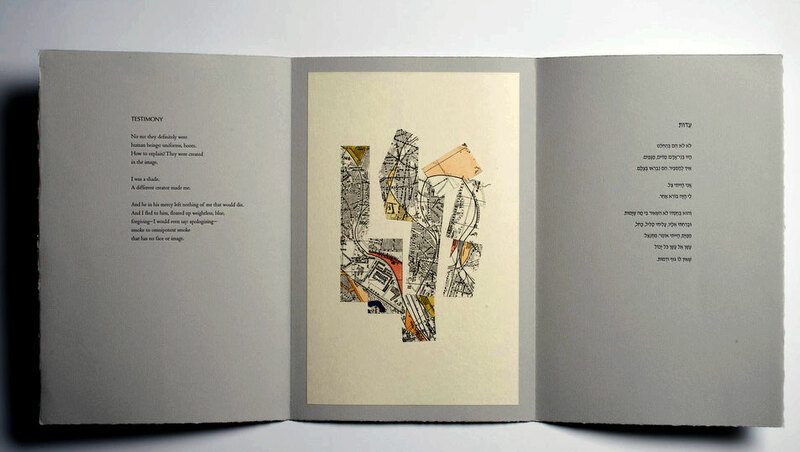 Image pages were hand drawn then printed using a combination of letterpress (polymer plates) and lithography. Text pages are Trajan and Garamond from polymer plates. 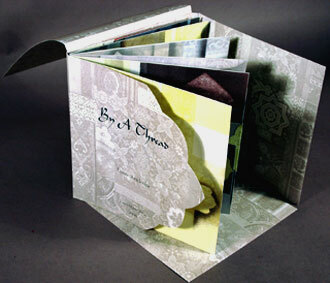 Image and text pages are printed then mounted on boards that form two-sided, continuous concertina binding. 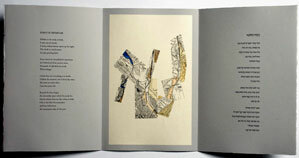 Spreads containing the Arabic and Hebrew words are two-layer folios pamphlet stitched into the concertina. These pages are backed by brief, relevant quotes from many sources. Housed in portfolio box covered in pale blue silk cloth with inset cover image. 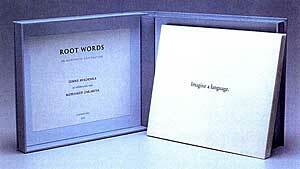 Inner box is lined in pale blue paper with title and colophon pages mounted inside. A timely, sensitive and considered exploration of the Arabic and Hebrew languages through seven words whose meanings are the same and whose pronunciations are very close in both tongues. The introductory text asserts: "Because they share ancient origins, these languages echo one another. Possessing similar sounds, familiar shapes, overlapping and borrowed meanings, both languages are simultaneously ancient and modern. So much alike, yet over centuries, their common origins have been overshadowed by painful divisions." The words for language, human being, trust, student, book, wisdom and sky are calligraphically rendered by the artists and framed by Avadenka's images, which were inspired by the combined beauty of Hebrew and Arabic letterforms. The seven words are also flanked by collaboratively written, eloquent and informative texts that traces the development of the two languages from their shared beginnings to their modern forms. Zakariya was responsible for the Islamic calligraphy and source material for the history of the Arabic languages. The Arabic words are lettered in the New Kufic style. Avadenka's research focused on the history of the Hebrew Alphabet and Hebrew calligraphy. The Hebrew is lettered in a style inspired by Sofer Stam and used in writing sacred documents. An elegant, thoughtfully composed contemplation.